I apologize for not getting those zucchini & squash recipes posted last week as I said I would. Hopefully you found a way to use up all your squash goodies. If all else fails, remember they freeze quite well (shredded and put in a freezer safe bag or box) to use later in soups and breads. Now that they are mostly gone for the year, I'm starting to miss them already, well, almost. That is what "eating in season" is all about. 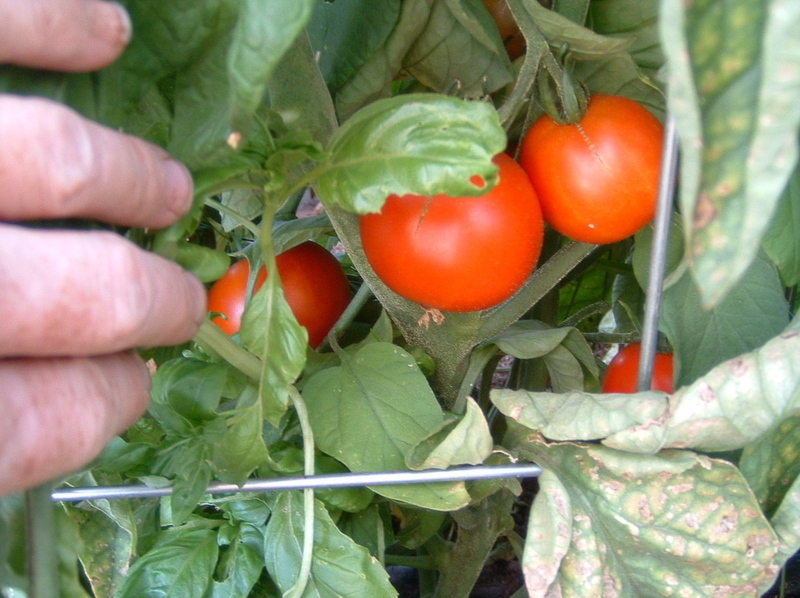 Yes, the tomatoes are finally ripening! It's only the last week of August and one full month later than they turned on last year. Must have been that cold stretch we had earlier this spring. But once they come on, they are REALLY ON. You'll be enjoying the tomatoes for many weeks to come. We are even installing a heater in the tomato greenhouse to pull them through those cold nights that are just around the corner. Speaking of cold nights, we've had our first frost already at the farm. So far it has only nipped the tops of some plants. If the freezing temps can just hold out long enough for more green beans. We have extra garlic for sale this year. There are 3 varieties we are selling: German Extra Hardy, Polish Jen, and Papa Doc Soft Neck. The price is $7 per pound when bought directly from the farm. Or $8 per pound when we are at the Jackson Farmers Market. If you are interested, email me. Any shipping costs will be extra. Today I stopped by the Kinslow Ranch in Thayne to buy my year's supply of honey. I had a nice visit with Mrs. Kinslow about the health of their honey bees, our mutual aphid infestations, how to keep honey and how NOT to heat it in the microwave. Then as I was leaving, I thanked her for their hard work in making this product available in our community. I was a saddened to learn that my source of wonderful Star Valley honey won't be around forever, and will probably be gone after the next 10 years. Earl (Mr. Kinslow) is 67 years old now and hoping to be able to keep his operation going until he's 75. He has no family who are interested in or able learn his trade. Another family farm gone by....or so it looks like it will be once Earl is retired. Another source of local product turned over to the big guys. I drove away feeling helpless. (For a moment I thought "We can do honey." Yeah right. Like I need another project. Maybe one of my kids.... Stop thinking.) Isn't there anything we can do to keep folks interested in family farming? For now, I'm glad I bought that extra case of honey to give away as presents. And I'll buy more next year. What can you do? Use your dollar wisely. Think about who you are supporting with your spending power. Support local producers with your spending choices. Give praise and thanks to those who make the effort to provide our communities with fresh, high quality, locally made products. Isn't that amazing? 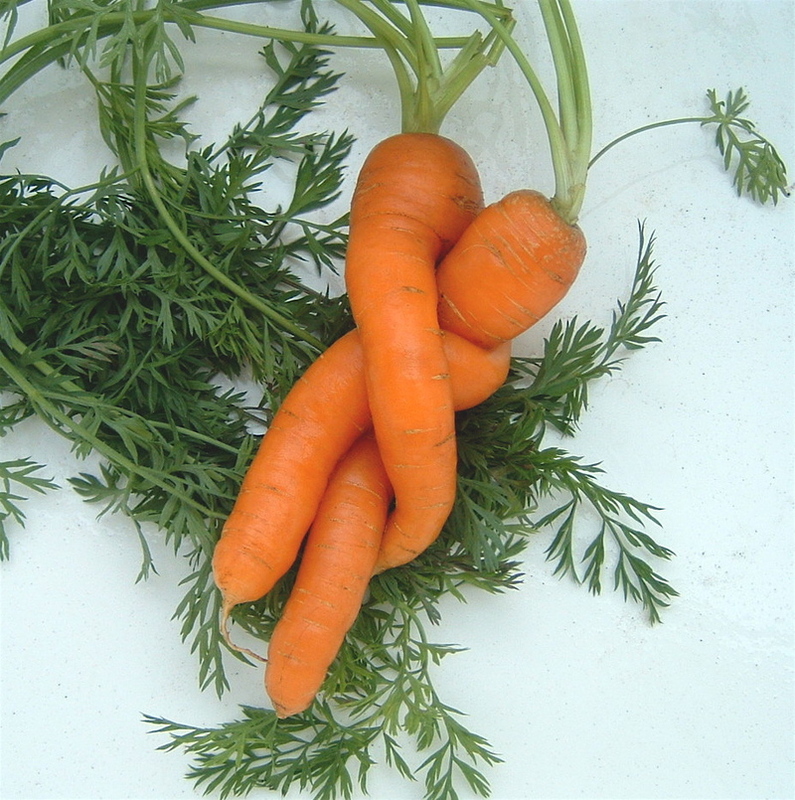 Can you tell which carrot is which, from the top to the bottom? We are on the down hill side of our season now. I think last week was the half way mark, but we'll just have to see how the weather holds out. Still plenty of food to harvest, and some items you haven't even seen yet: leeks, tomatoes, potatoes, peppers, etc. Shain went back to work this week (he's a school teacher too, for those who don't know). Both our children are back to classes starting tomorrow. I'm going to be home alone now. But not really "alone" because we have such wonderful workshares who come to help harvest and package food each morning. We have a good time, lots of laughs and plenty of interesting conversation. They are certainly good company. Beets - the tops are edible too! Yes, it is true. Your eyes are not deceiving you. There is no Salad Mix on this list. Don't worry, it is only missing this week so we could put our efforts into the bounty of other veggies you are getting in your bag. 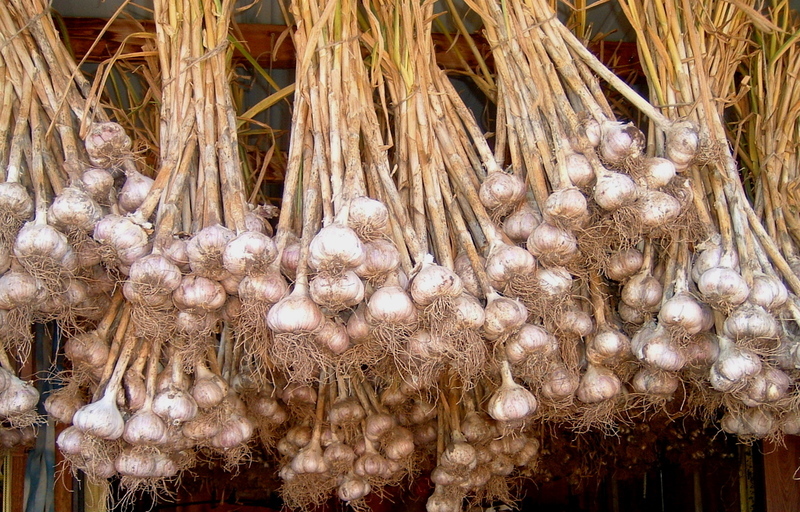 How we store garlic: It is our experience, that garlic stores best in a location that is dark and ventilated. It doesn't necessarily need to be kept cool, ours is kept at room temperature year round. We suggest it be kept away from any moisture, to prevent mold. I keep our garlic in the same mesh bag which you are receiving it. I hang this bag on a hook in the back of a kitchen cabinet. As needed, I remove a few bulbs and put them in a small crock/pottery piece with ventilation holes and a lid on top. The length of time our garlic keeps varies each year. Over time, it may sprout a little green shoot in the center. I don't mind this at all and will continue using it. But once it turns soft or rubbery, I usually toss it in the compost. The Papa Doc Soft Neck Garlic you are getting this week stores the longest of all the varieties we grow. It has a milder flavor than most hard neck varieties. We call this garlic "Papa Doc" after my grandfather, who was called "Doc" most of his life, and "Papa Doc" by his grand children. About 50 years ago, Papa Doc bought a bulb of garlic. He planted it in his garden, and continued planting it (organically even!) every year after that. Several years ago he shared some of it with Shain and we are carrying on his tradition now that he is gone. We are happy (and relieved) to say the garlic is out of the ground and hanging in the shed to cure. Thank you so much to those who came to help with this big project over the past week! You are wonderful! Last October, we planted approximately 3,000 row feet of garlic. Now it is hanging to dry before we go to the next step of cleaning it up to sell and give with the CSA shares. This period of drying out is necessary for helping the garlic store longer. If it is not completely dry, it will mold and rot. We also keep back about 1/2 of the bulbs to plant each year. Our garlic is rather remarkable in quality (especially the size of each clove) because we cull out the very best to plant the following season. We think you will be quite pleased. For the next week or two you will be receiving a single bulb of garlic with your share. Once we've got the hanging bunches cleaned up and bagged, you will receive two 1 pound bags. You may purchase more if desired. I will give you more information and instructions for storing later. The onions are so big and beautiful this week. And sweet. They were just calling out to be made into onion rings. Then as Shain started cooking, I suggested we fry up some squash with the batter too. Oh my! These are certainly tasty enough to eat without any dipping sauce (although my kids still called out for ketchup and ranch dressing). Now afterwards, I am thinking a nice dip made with the fresh dill would have been a very nice addition. This makes enough batter for 2 large onions and 2 zucchini or squash. Prepare fish, onions or squash for frying. Cut the onions into 1 inch rings, separating layers. Slice squash into 1/2 inch pieces. Heat 4 cups of cooking oil or lard on a medium setting. Beat the eggs and add beer, salt and pepper. Mix thoroughly. Fold in flour. 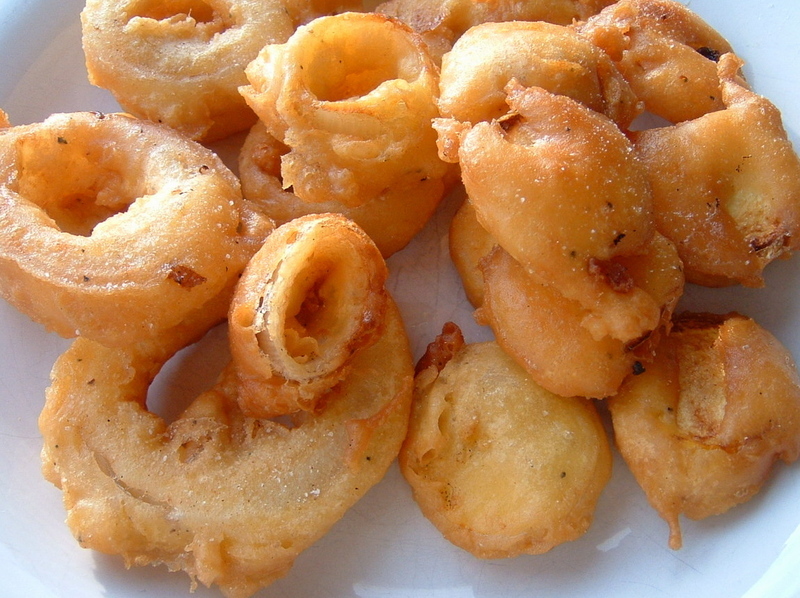 Dip prepared onion rings, squash or fish into batter, covering completely. Place into heated oil and fry until golden brown. Remove from oil and place on a plate with a paper towel for the oil to drain. Sprinkle with more salt and/or pepper if desired. Serve immediately. I am a very fortunate farmer's wife. Shain likes to cook. Even after a long day of work he will come inside and cook the family a nice meal. 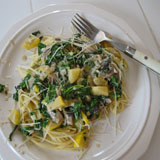 This week we have enjoyed some tasty dishes using the same veggies you are getting in your share. 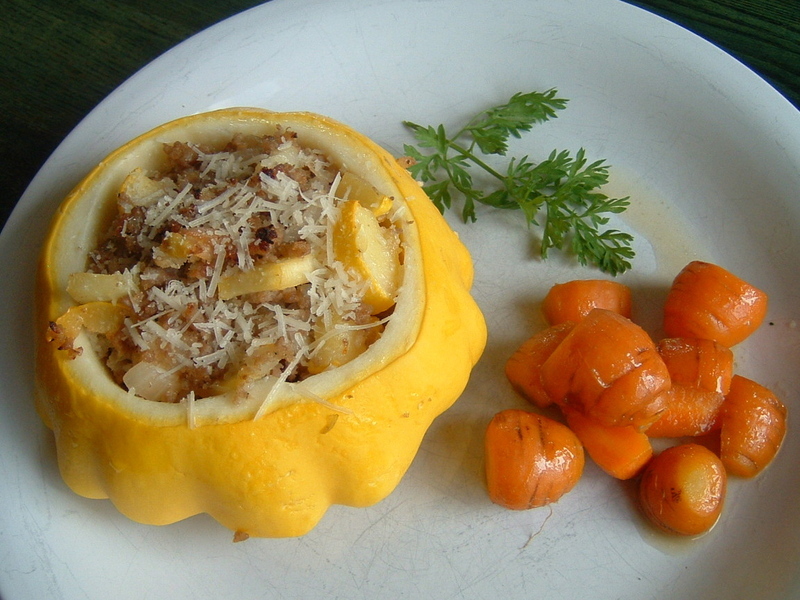 Carefully cut squash lengthwise (with Patty Pan squash, cut as in picture above). Scoop out squash, discarding seeds. Place squash shells in a baking dish. Meanwhile, cook sausage and onion in a frying pan. Once completely cooked, add squash and bread. Cook again until squash is tender, but not mushy. Add salt and pepper to taste. Stuff mixture back into squash shells. Bake at 375 until brown. Remove from oven and top with Parmesan cheese. Serve immediately. *Shain made this recipe with both the round Patty Pan Squash and the longer Crooked Neck Summer Squash. Next we will try it with the zucchini. Cut up carrots into bite sized pieces. 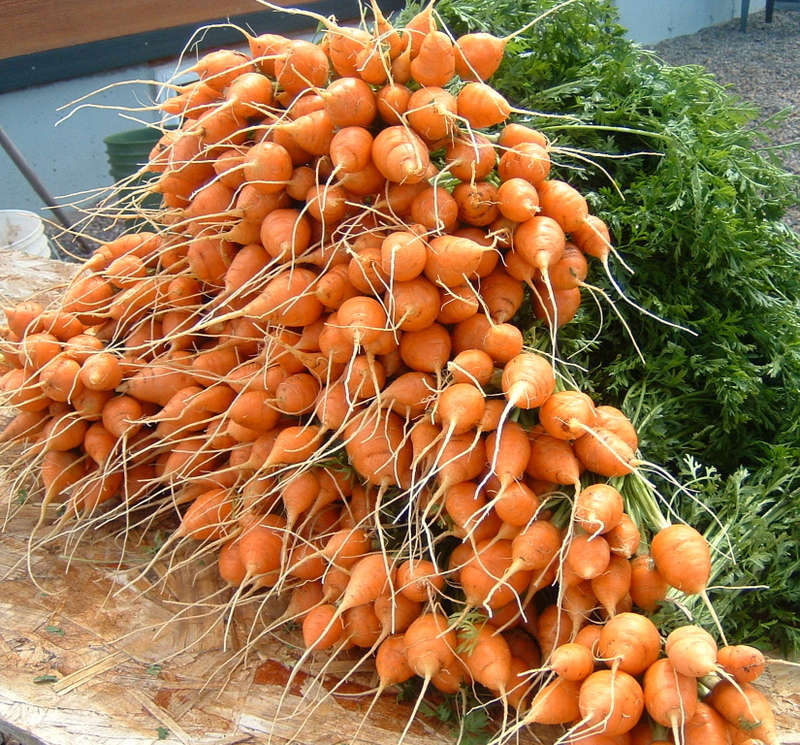 Put into a pot and fill with just enough water to cover the carrots. Cook carrots until tender but not mushy. Reserving 1/4 inch liquid in the pot, drain carrots and set aside. Add butter, stir over heat until melted. Add brown sugar and again stir over heat until completely mixed. Return carrots to pot and toss with sugar mixture. Cover with a lid and let sit for 5 minutes before serving. Another meal we enjoyed this week was the Fried Pasta. The recipe was given with Newsletter #7. 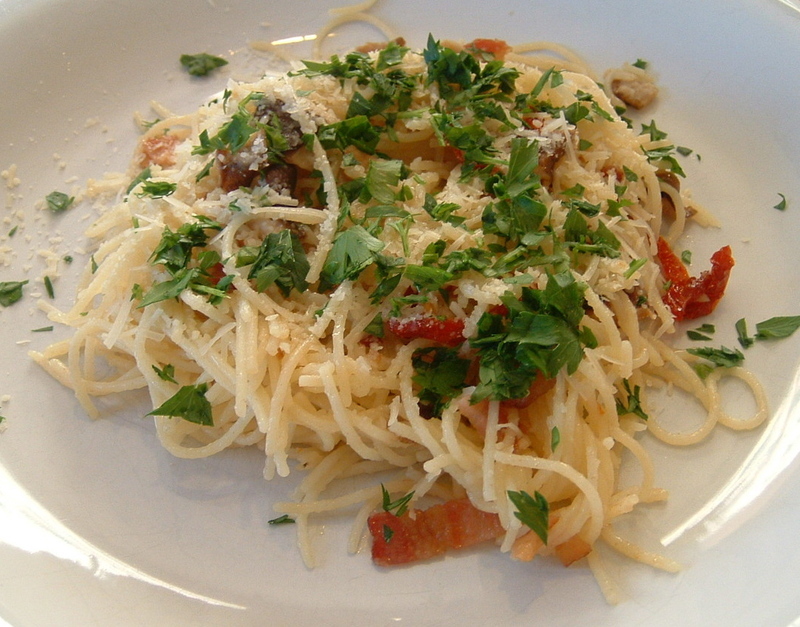 We altered the recipe slightly by adding Shitake mushrooms and sun dried tomatoes sauteed in butter. This is a light and refreshing meal. We invite all CSA members to a Garlic Harvest Work Party on Saturday, August 11th at the farm. Shain will be here all day so come when you can. Dress appropriate for the weather, bring a shovel if you can, and also bring plenty to drink. One of the things I enjoy about living in a small country community is the county fair. This year I decided to enter our goats in the open class goat division. We had to rearrange out work schedule for the week, which meant harvesting started on Monday and Shain had to give up his "fishing day" (what a guy! ), but we got the work done so Wednesday afternoon we could go to the fair. 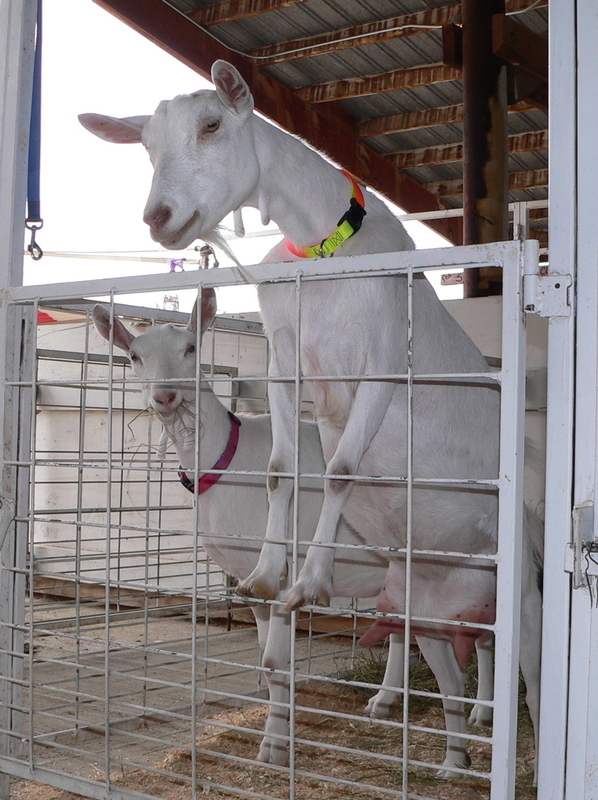 We took two of our Saanen does, Panama (on the right) and Daisy. I showed Panama and she took Grand Champion in the Senior Doe Class. My daughter Megan showed Daisy who took Reserve Champion in the Yearling Doe Class. The goats won some additional awards and we ended up coming home with quite a few ribbons. How exciting! I love county fairs. Peas - most of you are getting SHELL peas (the kind that are usually popped open to eat the peas), but a few are getting SNAP peas (the kind you eat the entire pod) which will be labeled "Snap". We are giving two types of beets to the CSA this year: Chioggia and traditional table beets. The Chioggia beets are an Italian variety. They are red and the taste is sweet. They also have a circular pattern when sliced open. The table beets are purplish in color and they look and taste "earthy" like traditional beets. The tops of the table beets are good to eat, and are cooked similar to Swiss chard. Your portion of salad mix is a little lean this week. The salad has taken quite a beating lately. The bugs are on in force. The hard rains we had last week did some damage to the young tender leaves. Then the heat has also taken its toll. Growing nice salad this time of the year is not easy. For the next several weeks your share will include zucchini or squash. 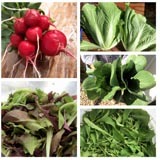 We will alternate the different varieties and sizes you are given each week between the 4 pick-up locations. There are two kinds of zucchinis. One is a yellow zucchini. It will be a long and straight and a golden yellow color. The Costada zucchinis are green with ribs down the sides. These zucchini are quite often used as "stuffers" so don't be alarmed by their larger size. There are also two varieties of squash. One is called Zephyr Summer Squash. It is a crooked neck squash which is yellow with a green tip. The other squash are called Patty Pan, they are yellow and round like a bowl. I have to include this picture. This is Shain working in the mud and rain last week. (Also notice the happy duck in background.) 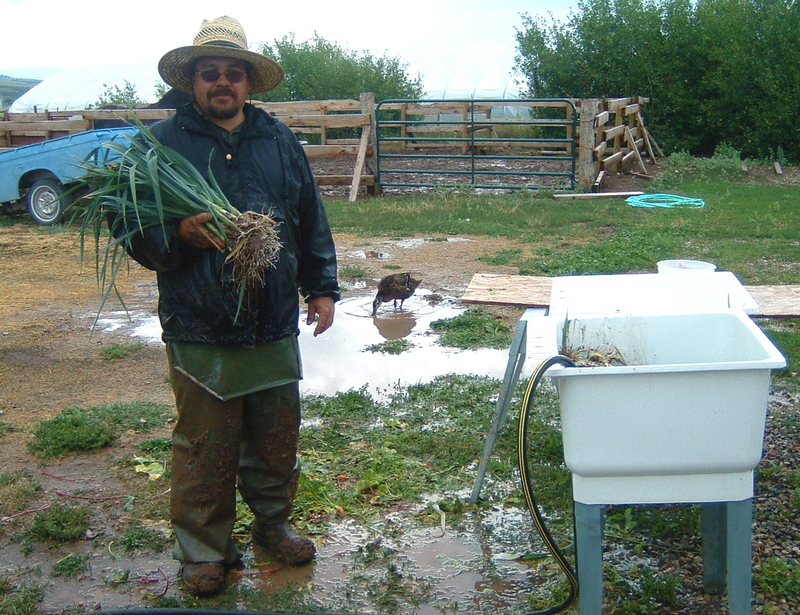 The rain made for some wet and messy harvesting. But we need the rain so I won't complain. And as I said above, what a guy!